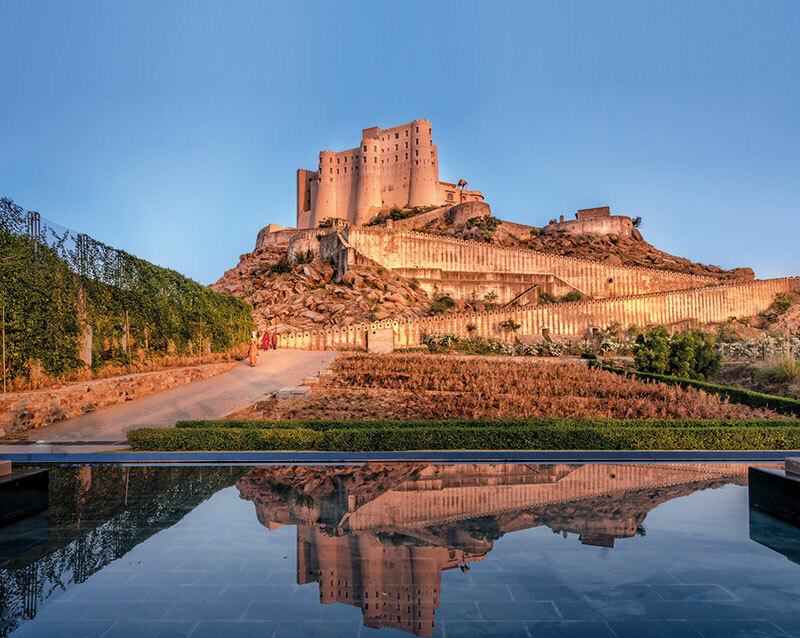 Perched on top of a granite hillock in the middle of the vast Aravalli Range, surrounded by hills dotted with temples, havelis and villages, stands Alila Fort Bishangarh. Built during Rajasthan’s royal era as an outpost guarding the kingdom of Jaipur against invaders from the north, the fort at Bishangarh had long outlived its original purpose. Challenges have been overcome to make the fort into the hotel it is today. On arrival, I am welcomed at the Courtyard Haveli with its luxurious green lawns, pool, pool terrace and juice bar, gym and a Play Alila club for kids. Wandering around, I discover an organic garden, a fruit orchard and a greenhouse amid the ravines. The ruins were strengthened and a road constructed up to the fort. The upper and outer wings were adapted to carve out 59 luxurious suites. With no typical floor plan, 23 different room configurations in all were created, which took some 1,800 hours to draw up. Twenty three unique venues have been created for meetings and celebratory events. The design concept has Rajput and Mughal influences. Jharokha-style windows, brass-embossed ponds, antique-style doors and wall frescoes with thikri mirror work, stone jalis and local marble all contribute to the simple design. Turrets, cellars and secret passages have been turned into bars, lounges and restaurants. The royal living quarters are now the indoor speciality restaurant Amarsar, which is inspired by the Silk Route. Here, I feasted on choliye ka shorba, Shekhawati spice rubbed pork belly, activated charcoal risotto, panna cotta and parmesan biscuit. The kasundi-marinated salmon blended perfectly with the marigold vinaigrette. The meal ended on a sweet note with matcha opera, lime and white chocolate cremeux and pistachio micro sponge. The Kachhawa Lounge where a secret escape route was discovered serves the four Cs — champagne, chai, coffee and cakes. Madhuveni is where one can sip cocktails and enjoy a cigar or pair a choice of smoked dishes with preferred malts. The menus have been innovatively curated by Chef Ranveer Brar. Nazaara, an outdoor grill dining terrace, serves Rajput and North-West frontier cuisine, which incorporates ancient ways of cooking on an open fire and sandpit. Chef Brar serves up Shekhawati and Bishangarh specialities while one enjoys a magnificent view of the Bishangarh village. I walk through a maze of paths, huge stones piled at the sides, to reach the dungeon of the fortress, where Spa Alila is located. Warm, ambient lighting, soothing scents of essential oils and a refreshing cup of tea welcome me into the spa. The extensive arena combines both Ayurveda and Eurasian therapy techniques, using a special selection of natural, active ingredients. The spa takes pride in its nurturing techniques passed down for generations but rarely practised today. The movements, known as ‘sayang sayang’ calm not just the body but also the mind and spirit. I enjoy The Roots of Jaipur, their signature spa treatment. A detoxifying, full-body scrub followed by soothing, deep-tissue massage strokes is combined with the healing oils of camphor, mustard and coconut. The relaxing experience ends with a basil and ginger infused steam bath. The Alila experience offers five themes — Cultural Learning, Conscious Living, Active Spirits, Culinary Arts and Couple Celebration. 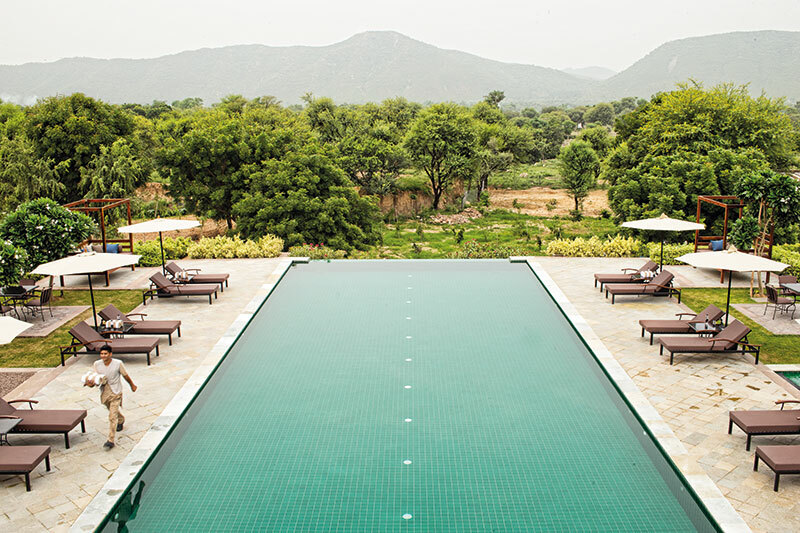 These include horseback riding, trekking in the Aravalli Hills, learning marble carving, visiting a textile factory, farming at an organic farm, mastering the art of braai barbecuing and personalised dining under the stars. 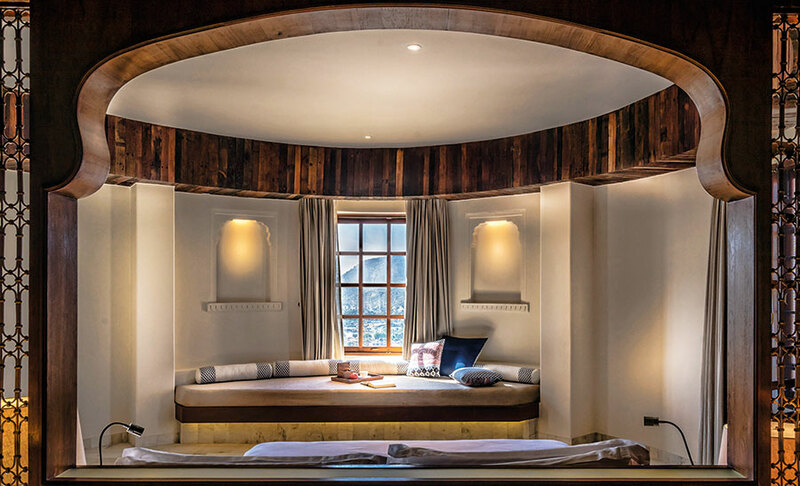 The 230-year-old warrior fort, in all its glory, is not just an architectural marvel but also an ideal destination for a luxurious experience and an idyllic weekend getaway.